Don't worry, I won't flood this blog with Christmas images continously till Christmas. Just intermittently until Thanksgiving, and then Christmas all the time. So today's photo is an in-between. The photo is really about the uniquely beautiful and lush backdrop of Hong Kong Disneyland's Sleeping Beauty Castle, but as it was taken during Christmas time, there are ornamented trees in the photo too! 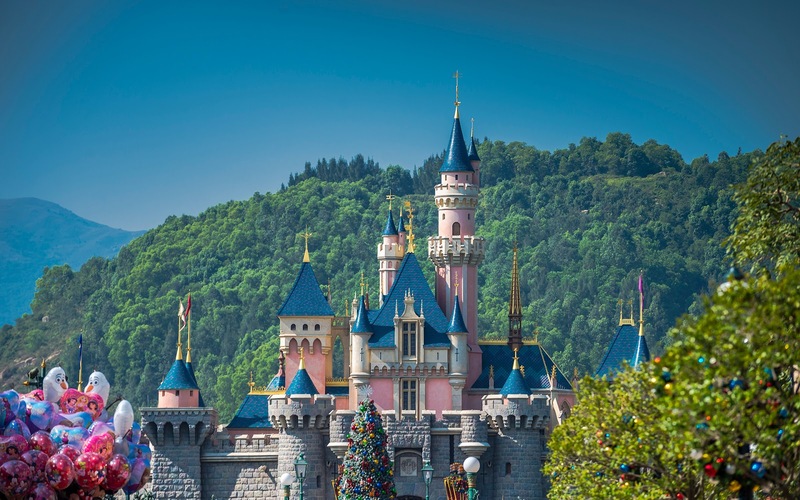 Among all the Disney parks, Hong Kong Disneyland unique in its mountainous setting. Every other park is built on flat, expandable land. But the setting here near Sunny Bay is lush and naturalistic, and it makes telephoto shots of the castle carry an extra sort of specialness. Framed this way, the coomposition shows the tops of things. Spires, regular trees, a Christmas tree... They all combine for an interesting view!